In one week's time Popeye has settled in! Just wants to sleep and he's another one that does not like to get out of bed in the morning. BUT the best news is that his eyes are doing super. He was found to have some old and new ulcers. All were a result of chronic dry eye. There was also some cataracts in the "good" eye. It's only been 1 day of the vet's eye drops and 1 day of the dry eye gel but they looks 1000xs better. No more thick haze or green stuff if but if it starts to look dry I just put the drops in and back to clear eyes! Of course one will take a while to come completely clear but he can blink and close them to sleep! He is such a sweet boy; the other 2 foster BTS are barking at ghosts and he is just sitting with me looking at them like what the hell? 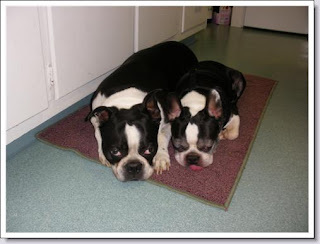 Popeye was scheduled to be given up by his owner and placed in NEBTR foster care. His foster mom Carolyn called to arrange for his transfer, and was told that he had run away that very morning. 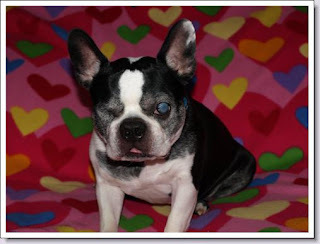 Of great concern was the fact that a huge snowstorm was predicted for the area, making it almost certain that a partially blind, older pup like Popeye would have practically no chance for survival. A few of the great NEBTR members, such as Missy, went to the area and spent the evening looking for him in the cold with flashlights. NEBTR members called everyone they could think of, and outside rescue experts offered their assistance. The snow came, and hope was dying. 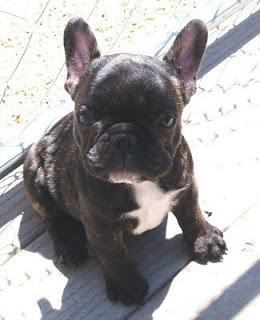 Then, the next day, he was discovered at a shelter in Briarcliff, NY. NEBTR transporters immediately went to work to transport him and bring him to Carolyn, his foster mom. What a celebration! Above you can see a picture of the little guy, and there is also an album of his photos below. Thanks to everyone who was involved in his rescue, and to everyone who worried and prayed for Popeye!! Manley, who has found his forever home with Jane Tirc, is being featured tomorrow at 7:30 pm on a radio show in Boston. Jane will be calling in and talking to him about Manley and the NEBTR. People who are listening might want to see pictures of Manley since they will be hearing his story. And here is a link to a newspaper story about Manley. 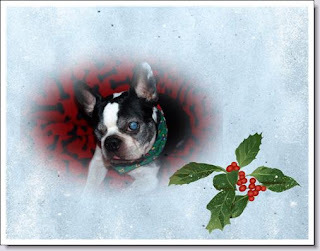 As the Amityville paper wrote, "Manley, a little blind Boston Terrier, was alone, wandering the streets on a rainy night. Imagine being scooped up by caring youths. Imagine then being delivered to the best of hands because of various breed rescues working together. "Manley couldn’t see but luckily a series of strangers saw him. 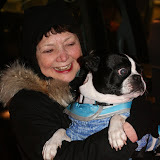 Jane in Kingston, a nurse and volunteer for the North East Boston Terrier Rescue (NEBTR), called to say that he looked like a Boston but it didn’t matter. She rarely fostered because her home is a one way door; yet his photos were so touching; she’d gladly take this guy." 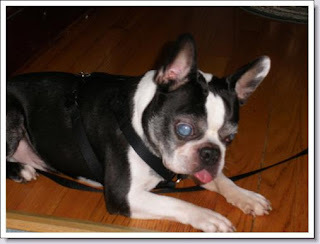 Manley had advanced glaucoma, which was causing painful pressure in his eye. He was determined to be between 6 and 10 years old. The eye was removed and sutured shut. 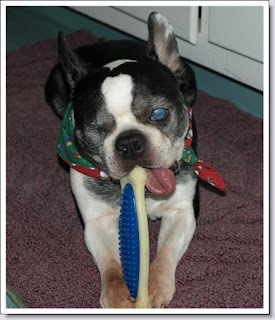 Despite his lack of sight, Manley fit right in at Jane’s house, settling as soon as he realized his bed was next to hers. 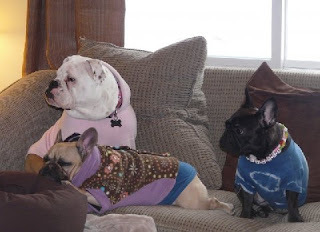 He blends with her Bostons- Buster and Marilyn, and already knew to spin around and sit for a treat when he comes in. He’s comfy and on some level senses he will never be put in harm’s way again. He is now loved and safe in Jane's home. What a wonderful ending to the story! 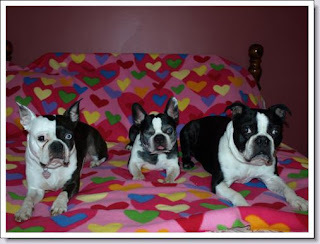 Even though this is a Boston Terrier group, these Frenchies are too cute not to add to our site. First is Sheryl Trent's Fizzy. Sheryl says, "Look at this face and tell me how wicked you think she might be. She's a puppy in this pic. Now she's 2. Her name is Fizzy and I just adore her. My husband says her only job is to be cute and she does that to perfection. All else she ignores. 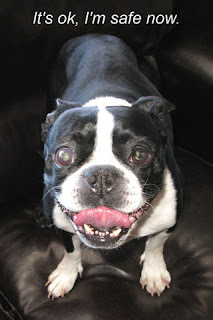 She isn't as busy as the Bostons, but certainly more stubborn." the heat. I will feel the sun's heat, and the rain's coolness, and be allowed to smell all that can reach my nose. My fur will shine, and never be dirty or matted. may know who I am among many. My name will be used in joy, and I will love the sound of it! Here in this house... I will never be a substitute for anything I am not. I will never be used to improve peoples' images of themselves. I will be loved because I am who I am, not someone's idea of who I should be. I will never suffer for someone's anger, impatience, or stupidity. I will be taught all the things I need to know to be loved by all. If I do not learn my lessons well, they will look to my teacher for blame. Here in this house... I can trust arms that hold, hands that touch... knowing that, no matter what they do, they do it for the good of me. If I am ill, I will be doctored. If scared, I will be calmed. If sad, I will be cheered. No matter what I look like, I will be considered beautiful and known to be of value. I will never be cast out because I am too old, too ill, too unruly, or not cute enough. My life is a responsibility, and not an afterthought. I will learn that humans can almost, sometimes, be as kind and as fair as dogs. -- I saw this on one of my greyhound lists. I thought I'd share it.